SAN FRANCISCO – Hundreds of masked, black-clad anarchists who overwhelmed a peaceful California protest and assaulted at least five perceived political enemies have reignited the debate over ensuring free speech while protecting public safety in the city where the U.S. free speech movement was born in the 1960s. After planned weekend rallies were violently disrupted or canceled, supporters of President Donald Trump and other politically conservative activists complained their free speech rights were blocked by liberal politicians who they say incited left-wing extremists. When Patriot Prayer founder Joey Gibson canceled his San Francisco rally Saturday, he blamed San Francisco Mayor Ed Lee and Democratic U.S. Rep. Nancy Pelosi for falsely labeling the organization as a hate group and inciting extremism to vow violent disruption. Others said that the violence on Sunday in nearby Berkeley, known as the U.S. heart of the free speech movement, tarnished their peaceful opposition to Trump’s policies. “It played into the false narrative that some conservatives have spun,” about violent left-wing stifling of free speech, Berkeley Mayor Jesse Arreguin said Monday, a day after the anarchists assaulted the people they thought were right-wing extremists and pepper sprayed Gibson. Gibson’s supporters said the Berkeley police failed to protect the handful of right-wing supporters who showed up at the park Sunday afternoon by allowing the black-clad demonstrators to take over the city park without opposition. The right-wing group was outnumbered by thousands of opponents, but the rally was tense but peaceful until the anarchists arrived. The attack on the conservatives at the Berkeley park “definitely sends the wrong message,” said Ed Tisher, who came to oppose them but ended up helping a Trump supporter knocked to the ground and shielding him from more possible violence until police arrived. Yvonne Felarca, a spokeswoman for the militant left-wing organization By Any Means Necessary, defended Sunday’s violence. She called it self-defense, though it there were no indications anyone one tried to physically harm the anarchists at the park. Felarca was charged last month with assault and helping incite a riot in Sacramento last year. The June 2016 melee between about 30 members of a neo-Nazi group and 300 counter-protesters ended with 14 people suffering stab wounds, cuts and bruises. Berkeley Police Chief Andrew Greenwood said he ordered officers to abandon the park when the black-clad activists arrived. Confronting them would have risked escalating the violence and jeopardizing the safety of the peaceful protesters, Greenwood said. “Protecting a piece of grass in that situation was not worth it,” Arreguin said. Sid Heal, president of California Association of Tactical Officers representing police trained in riot control, said it’s “always a tough call” officers to determine how to react when they respond to a crowd on the verge of a riot. He said he usually advises officers to aggressively arrest people obviously intent on violence like those carrying gas masks or sticks who have covered their faces. Using heavy barriers that cannot be used by protesters as battering rams is also advisable, Heal said. 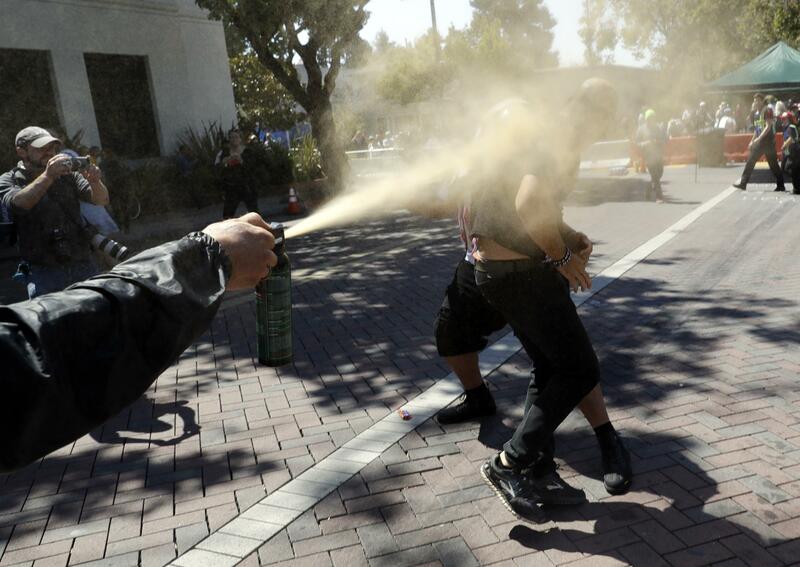 Berkeley police initially used both strategies, quickly arresting people who covered their faces or brought into the park items that could have been used as weapons. Police also set up water filled, plastic barriers to keep political opponents separated. But Berkeley’s police chief said he changed tactics after several hours and pulled officers out of the park when it became clear that only a handful of conservative activists remained there. Heal, who helped the University of California, Berkeley, prepare for unrest ahead of an appearance by the politically conservative author Ann Coulter in April, said he believe it was the right decision. “I wouldn’t fight over a piece of land that has no value,” Heal said. Coulter canceled that appearance out of concern for violence but blamed the university for failing to ensure safety for conservative speakers. The campus canceled a Yiannopoulos speech in February after demonstrations turned violent. Newly appointed University of California, Berkeley chancellor Carol Christ said the campus would be prepared. “The university has the responsibility to provide safety and security for its community and guests, and we will invest the necessary resources to achieve that goal,” she said in a statement. Published: Aug. 28, 2017, 3:19 p.m. Updated: Aug. 28, 2017, 7:38 p.m.